Founded by Alex M.O.R.P.H. 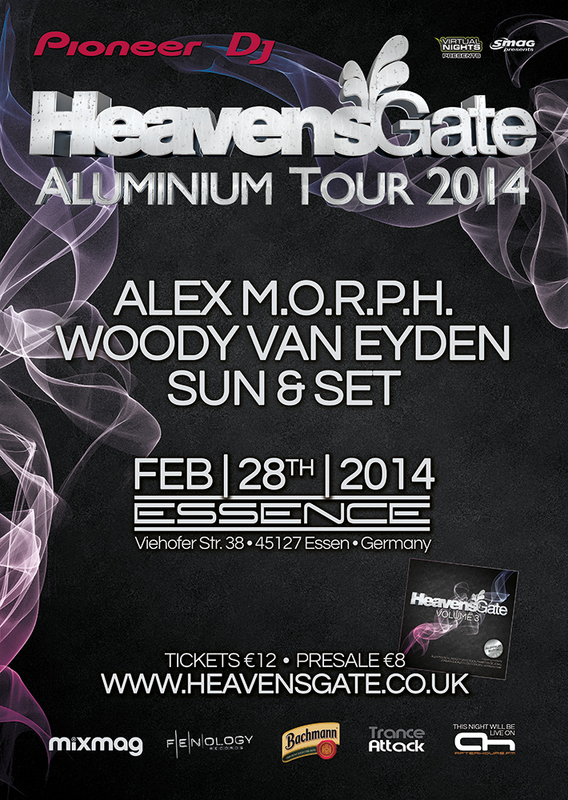 and Woody van Eyden in 2004, HeavensGate started as a monthly radio show. In the years since, this radio show has become a weekly event on a global network of over 200 radio stations in over 50 countries. Today, HeavensGate is one of the most valued brands in the dance world and reaches over 1.5 Million listeners around the world every week. With 22 shows, the HeavensGate AlbumRelease WorldTour 2013 made it to 12 countries. With an impressive line up of radio guests including Ferry Corsten, Aly&Fila, Cosmic Gate, Ørjan Nilsen, Mauro Picotto and many others, plus over 50 Live events including co-ops with top league artists like Tiësto, Paul van Dyk, W&W, Dash Berlin and Gareth Emery and of course four seasons LIVEfromIBIZA at Café Mambo. HeavensGate after more than 400 episodes of this two hour EDM show reaches its 10th anniversary. To celebrate this 10th anniversary, HeavensGate will release a brand new double album in early 2014, including tracks from the founders Alex & Woody, their residents and friends like Jordan Suckley, Ruben de Ronde, James Dymond and more." For the HeavensGate global tour, we've already confirmed events in Germany, England, South Korea, Japan, Malaysia, Indonesia and of course another LIVEfromIBIZA season from Café Mambo alongside the hosting of boat parties with some of the world‘s most respected DJs. Yet again I must write this. Would it kill you to post the beginning and end times at least several days before?! People want to plan! And hopefully timeslots! Last edited by Trance Dreamer; Feb 28th, 2014 at 02:22. Relevant people read my post & they did not post times. Appalling. For once can we have a livestream in decent volume?! That means it not decrease from this. Thanks!